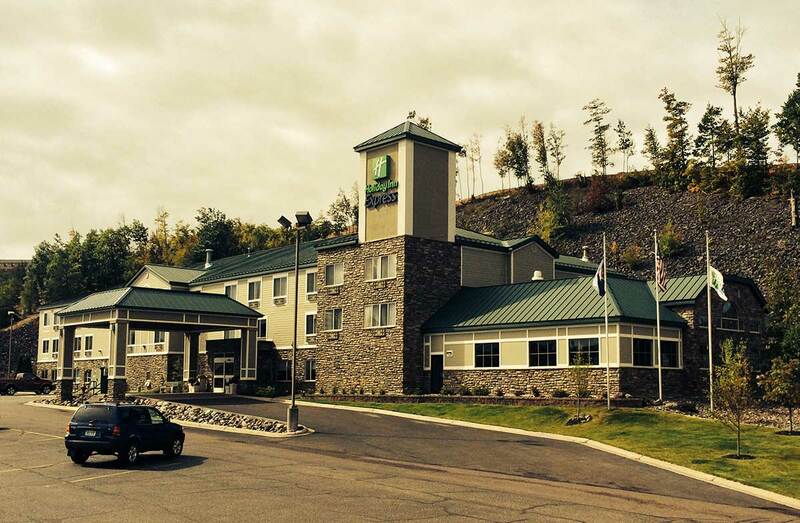 The Holiday Inn Express was the second 24 gauge standing seam metal roof we have installed for Moyle Construction in Houghton MI. During this remodel we were especially careful to employ techniques we have developed to control the appearance of oil canning which although posing no functional issues can make metal roofs look less than perfect. Over the years we have developed strategies for keeping metal roofs looking solid and flat with clean lines so that buildings take on the architectural look that owners are striving for with this high quality roof product. The basic rules for avoiding the appearance of oil canning are: 1) use heavy 24 gauge steel, 2) keep panels to 17” wide (2’ is too wide to control oil canning), 3) use minor rib dies to give strengthening ribs in the panels, 4) handle panels carefully during installation not to stress or deflect the ribs, 5) use one point of ridged fixation of the panel at the ridge usually- let other points of attachment (sliding clips) allow for expansion of the panel.